The Apple iPhone 7 / 7 Plus features an A10 fusion chip with a 16 nm technology with a core count of 4 (dual core high performance with clock speed of 2.34 GHz and another Dual core low performance with clock speed of 1.7ghz). The Samsung Galaxy S8 / S8+ features an Exynos 8895 chip with four Exynos M2 cores with a clock speed of 2.5 GHz and four Cortex-A53 cores with a clock speed of 1.7 GHz. Both the processors are based on the 64-bit ARMv8-A architecture which is pretty good. The GPU in the S8 is the Mali G-71 with a core count of 20 and the GPU in the iPhone 7 is the Power VR series with a core count of 6. It includes updated CPU workloads and new computes workloads that model real world tasks and applications. Geekbench is a benchmark thet reflects what actual users face on their mobile devices.The iPhone 7 completed the test in 2 min 36 sec and the S8 completed the test in 4 min 8 sec. The iPhone came out with a single core score of 3522 and a multi core score of 5969 whereas the Samsung Galaxy S8 came out with a single core score of 1995 and a multi core score of 6679. 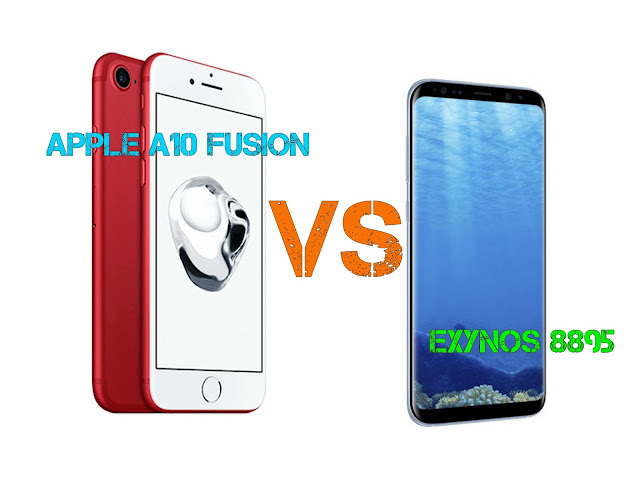 As such, in this test, it is clearly shown that the individual cores of the A10 Fusion is much more powerful than that of the Exynos but the A10 trails behind in multi-core performance. It is a draw here as such! Antutu is one of the most popular benchmark apps as it tests many parts of the device and assigns an overall score. The iPhone completed the test in 4 min 27sec and the Galaxy S8 completed in 5 min 27 sec. The iPhone scored 167297 and the S8 scored 173153. The iPhone achieved a 3D score of 51918, UX score of 52530 and CPU score of 4998 whereas the S8 got a 3D score of 73206, UX score of 50986 and a CPU score of 38520. Therefore the Exynos 8895 had a slightly upper hand over the Apple A10 Fusion. It is basically more of a gamer’s benchmark. It tests how good your device runs a game compared to other devices. The iPhone completed the test in 4 min 26 sec where as the Samsung Galaxy S8 finished it in 3 min 58 sec. The slingshot extreme score on the iPhone is 1840 and on S8 is 3235. The Graphics score on iphone is 2476 and on S8 is 3566. Apart from that some graphics benchmarks were conducted so as to see the framerates of that these two processors could acheive in their respective flagships. The first graphics test on the iPhone showed 16.12fps and on the S8 showed 21.9 fps. The graphics test (#2) on the iPhone featured a score of 8 and a score of 12 on the S8. The physics section 1 on the iPhone showed 27.76 fps and on the S8 showed 34.7 fps . The physics section 2 showed 10.54 fps on the iPhone and 27.2 fps on the S8. The physics section 3 showed 4.44 fps on the iPhone and 14 fps on the S8. So as we can see that the S8 completely smashed the iPhone 7 at this one. This section is not that surprising actually. The GPU that the Exynos 8895 comes with is quite a monster when it comes to gaming. At a fixed resolution of 1920 x 1080 pixels rendered off-screen, we get a better sense of each SoC’s performance, separate of the device’s display. In this test both the devices completed more or less at the same time- the iPhone took 1 min 6 sec and the S8 took 1 min 14 sec; quite a negligible difference. The result showed a frame count of 3861.7 frames (62.2854fps) on the iPhone 7 and 3910 frames(64fps) on the Samsung Galaxy S8. So both the devices and therefore their processors were quite equal in this test. This test showed that the iPhone 7 scored 12295 and the Samsung Galaxy S8 got 8075. This is effected by CPU performance and how well the browser has been optimised. The iPhone completed in about 193.2 milliseconds (+/- 3%) and the S8 completed in about 296 milliseconds (+/- 3%). Here the the iPhone 7 beat the S8, though the difference is quite negligible. Here the iPhone completed in 187 milliseconds and the S8 in 504 milliseconds. The iPhone scored 27404 and the S8 scored 13596. The Exynos seems to get beat in these Java Script Benchmarks by the Apple A10 Fusion. The write speed in the iPhone 7 is 315 Mb/sec and the storage reading speed is 887 Mb/sec whereas the write speed in Samsung Galaxy S8 is 95 Mb/sec and the storage reading speed is 133 Mb/sec. This explains the lightning speed of the Apple A10 in saving files and stuff! The iPhone scored 80069 and and the S8 scored 59063. Other than the above tests some other basic tests have been performed that checks how fast the phones open apps and files. The iPhone surprising was at a draw with the Samsung Galaxy S8 (Exynos version). This proves how far Samsung has come. Apple's iPhones were always the king when it came to performance in the phone market. However it's leading A10 fusion Chip now faces an intense challenge by Samsung's Exynos 8895 processor. Both are quite equally head to head when it comes to processing power and none is a clear winner to be honest. If you got some other info or have some thoughts to share, then drop by a comment!